The symbiotic binary V694 Mon shows regular outbursts with the period of 1930 days (Doroshenko et al., IBVS No.3824, 1993) above the secular trend of brightening from B = 14.1 in 1898 mag to B = 9.25 mag in 2016. The star reached the breaking-record brightness in the last 2016 February outburst (ATel#8653) predicted with the known period. Broad and deep blue-shifted absorption components of Balmer emission lines in the spectra forming by high-velocity jets, and strong flickering of brightness in the scales of minutes and hours with the amplitude up to 0.8 mag in the V band and 1.0 mag in the U band are typical for this star. On 2018 Nov 4.12 UT we observed brightening of the star up to the UBVRc magnitudes of (9.15, 9.57, 9.25, 8.50), consequently. Observations were performed with the SAO 1-m Zeiss telescope and CCD photometer. Additional analysis of the photometry taken with the 50-cm Maksutov telescope of the Moscow University Crimean Station along with SAO data finds the star in this state in five nights between 2018 Oct 11 and Nov 5. Its V brightness varied less than 0.07 mag, what suggests the disappearance of flickering. A previous observation taken on 2018 May 2 at the end of the past observational season gave UBVRc = (10.31, 10.52, 10.22, 9.41), and flickering was then observed. The recent brightening maximum happens at the phase 0.52 of 1930-day period, and it was not predicted. The spectral observations were performed with the SAO 1-m telescope and UAGS spectrograph. In the spectra of V694 Mon taken around 2018 Nov 16.04 UT in the range between 3870 and 5280 Å with the spectral resolution 2.2 Å, we found the radical changes in comparison with the spectra of the previous season. No high-velocity absorption components are seen. Hβ line has wide emission shoulders spreading to the velocities up to 1000 km/s in both sides from the line center. There is a weak absorption component at the velocity of -260 km/s relative to the peak of the emission. Higher-number Balmer lines do not have emission shoulders but have the absorption components at -260 km/s. The depths of them increase with the number. Wide and shallow He I absorptions changed by narrow ones located on the velocity -260 km/s. Peaks of the Fe II emission lines are shifted by -50 km/s relative to the peaks of Balmer lines. The same features are presented in the UAGS spectrum taken on 2018 Oct 17.10 UT in the range of 3800 - 7880 Å with the lower resolution of 6.2 Å/pxl. 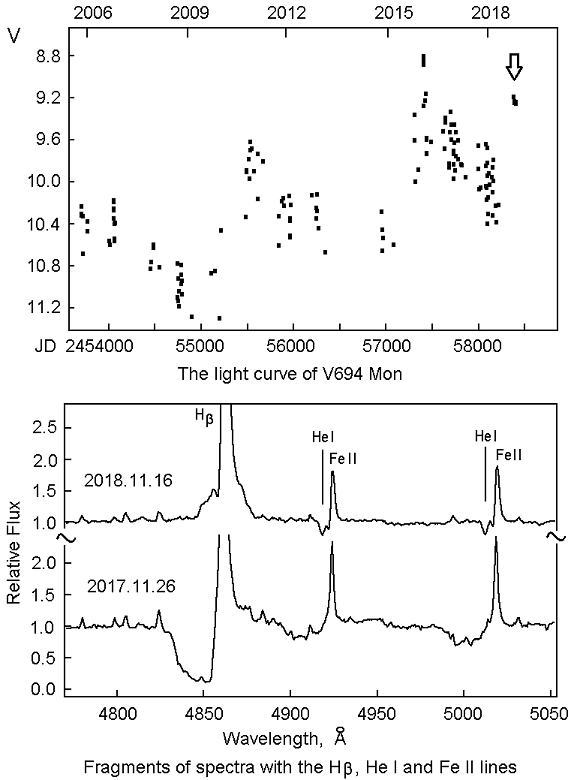 While the last spectra taken at the past season from January 9 to March 9, 2018 look typical of this star with the high-velocity absorption components. We explain this active state of the V694 Mon system as an episode of formation of a common envelope due to the transit of the system to a dynamical mode of accretion with an increased rate. This accretion matter filling the Roche lobe of the compact companion blocked the jets and covered the direct visibility of the companion deleting flickering. The shell of the companion generates a stellar wind with the velocity of 260 km/s. We observe similar episodes in the relativistic jet binary SS 433 with blocking jets and even the disappearance of eclipses. In SS 433, these episodes finish with an ejection of the envelope. View of UBVR light and color curve. Java compatible browser needed. 2011 Feb 1.85 UT (10.123, 10.200, 9.897, 9.188). The recent outburst reached the peak brightness in the end of December 2010, that is within the phase range of 0.86-0.89 calculated with ephemeris given above. Then the star was only 0.4 mag fainter than in the strongest 1990 event, so the recent event is the second in power. The active state may continue in 2011. Figure 1. The light curve showing all the historical observations in the B band. The systematic brightening trend was deleted. The last observations are given in the circles. On 2011 January 3.046 UT, we have taken the spectrum of V694 Mon using the Russian 6-m telescope BTA equipped with the SCORPIO spectral camera. The spectrum has a resolution of ~13 A and covers the region 3626 - 7876 A. Stationary emission is seen in H-alpha, H-beta and H-gamma lines at the radial velocity of +60 km/s. Equivalent widths of these lines are -86, -11 and -2.5 A, correspondingly. There are many FeII emissions in the spectrum. The absorption components of Balmer lines and HeI 5875.6 A line are extended towards the blue side to the velocity of -4200 km/s. The deepest absorption is seen at the velocity of -3100 km/s with depths of 0.36 and 0.46 relative to continuum level in H-alpha and H-beta. Whereas H-gamma line and higher Balmer lines have double absorption profile with components at -700 and -3200 km/s. HeI 5875.6 A absorption is also double with the components at -350 and -3300 km/s. Absorption components of H-alpha, H-beta and H-gamma have equivalent widths 27, 17 and 10 A, correspondingly, and absorption component of HeI line has EW = 5 A. The M-type star spectrum is observed well above 6000 A, but the molecular TiO absorption band heads may be identified at lower wavelength. The spectrum confirms high-level activity in V694 Mon. Figure 2. The medium resolution spectrum of V694 Mon taken with the Russian 6-m telescope BTA and SCORPIO spectral camera.